Breast cancer is the most common malignancy in women in the United States and is second only to lung cancer as a cause of cancer death. The treatment of breast cancer is rapidly evolving. Results from numerous clinical trials continue to expand new therapeutic options, treatment and risk reduction strategies, and diagnostic/prognostic tools. Health care professionals need to be educated on current and emerging scientific data to make evidence-based treatment decisions and to provide optimal care for patients with breast cancer. This congress will provide expert insights on the current standard of care for patients with breast cancer to assist oncology health care professionals with formulating breast cancer management strategies. Featured sessions at this program will include the latest clinical research updates presented at the 2018 San Antonio Breast Cancer Symposium® (SABCS). This update has become the highlight of this congress hosted by the Robert H. Lurie Comprehensive Cancer Center of Northwestern University each year. • Summarize the current standards of oncology care, key updates in the NCCN Clinical Practice Guidelines in Oncology (NCCN Guidelines®), and clinical research updates from the 2018 SABCS, and integrate appropriate strategies into clinical practice to optimize the management of patients with breast cancer and improve patient outcomes. • Evaluate new, emerging and novel therapeutic agents, advances in care, and clinical trials data and apply relevant findings into the management of patients with breast cancer. • Recognize the association between some gene mutations (e.g., BRCA1/2) and hereditary cancer syndromes and increased risk of breast cancer. • Review the factors for determining when genetic counseling should be recommended for individuals with a personal and/or family history of breast cancer. • Identify advantages and difficulties associated with multigene testing for breast cancer. • Recognize the importance of large studies to inform the development of cancer staging systems. • Outline the important changes specific to breast cancer staging in the AJCC Cancer Staging Manual, 8th Edition. • Utilize the updated AJCC Cancer Staging Manual, 8th Edition in clinical practice. • Discuss the risks, benefits, and goals of non-conventional therapies with patients and survivors. • List several evidence-based integrative therapies that can be useful for patients with breast cancer and survivors. • Recognize the importance of integrating conventional and non-conventional care and coordination between providers. • Develop evidence-based approach for the management of the axilla in patients with early stage breast cancer. • Individualize radiation therapy recommendations based on patient and tumor characteristics. • Describe the difference between breast cancer factors that are prognostic, predictive, or both. • Compare multigene assays available for hormone receptor-positive, HER2-negative disease. • Select appropriate multigene assays based on patient and tumor characteristics and individualize adjuvant systemic therapy recommendations. • List risk factors for the development of lymphedema after breast cancer treatment. • Discuss the negative impact that lymphedema can have on breast cancer survivors. • Describe management approaches that can improve lymphedema symptoms in breast cancer survivors. • Recognize key patient and clinical factors that influence selection of systemic neoadjuvant therapy. • Select appropriate evidence-based adjuvant endocrine options for patients with early stage HR-positive breast cancer. • Discuss clinical data of new and emerging supportive care interventions to improve quality of life of patients undergoing neoadjuvant/adjuvant chemotherapy. • Select evidence-based first- and subsequent-line treatment options for patients with metastatic breast cancer based on hormone- and HER2- receptor status, and discuss the benefits and risks of treatment options with patients. • List the current therapeutic approaches for triple negative metastatic breast cancer. • Outline new and emerging therapeutic options for patients with metastatic breast cancer. NCCN designates this live activity for a maximum of 5.25 AMA PRA Category 1 Credits™. Physicians should claim only the credit commensurate with the extent of their participation in the activity. NCCN designates this educational activity for a maximum of 5.25 contact hours. NCCN has been authorized by the American Academy of PAs (AAPA) to award AAPA Category 1 CME credit for activities planned in accordance with AAPA CME Criteria. This activity is designated for 5.25 AAPA Category 1 CME credits. PAs should only claim credit commensurate with the extent of their participation. Successful completion of this CME activity, which includes participation in the evaluation component, enables the participant to earn up to 5.25 medical knowledge MOC points in the American Board of Internal Medicine’s (ABIM) Maintenance of Certification (MOC) program. Participants will earn MOC points equivalent to the amount of CME credits claimed for the activity. It is the CME activity provider’s responsibility to submit participant completion information to ACCME for the purpose of granting ABIM MOC credit. 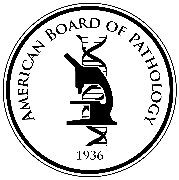 This activity has been registered to offer credit in the American Board of Pathology’s (ABPath) Maintenance of Certification program. Successful completion of this CME activity enables the participant to earn up to 5.25 Lifelong Learning (Part II) credits.